You are currently browsing the tag archive for the ‘Emanuel Bohucký’ tag. Matt Cocker slams the ball into the net to open the scoring in this morning’s friendly at NHP. 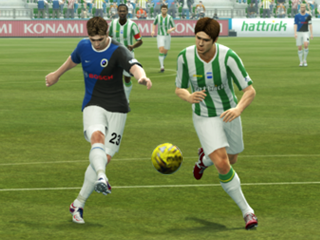 Two goals in each half saw Brook Street ease to a comfortable 4-1 win over German Liga VII side Sportfreunde Veischedetal at New Home Park as preparations for the new season step up a gear. Matt Cocker fired Brook Street into the lead in the fourth minute, and Phil Mullally doubled the lead nine minutes later. Eike rang the changes at half-time and took himself, Matt Cocker and Zeke Alexandrino off to be replaced by Nicky Breaden, Lachlan MacKinnon and Jim Barnstaple respectively. The substitutions didn’t seem to affect the fluidity of the game however, and within four minutes of the restart, Andrew Cleary slotted home number three. Were it not for Jim Barnstaple being in outstanding form, Brook street could have been punished for taking their foot off the gas. With sixty-five minutes played he somehow got a fingertip to Shunta Furukawa’s netbound shot to turn it over, before denying Jérémy Sainte-Luce moments later. Phil Mullally put the result beyond doubt in the seventy-fourth minute, but Carlo Maria Tiso fired in a consolation goal for the visitors seven minutes from time to wrap up the scoring. 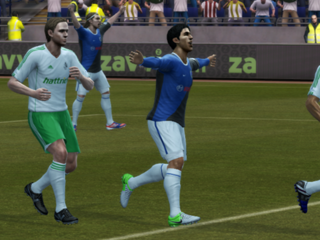 While Eike was pleased with the result, he accepted that perhaps his team had been a little ‘lucky’. “I think we owe Jim [Barnstaple] a huge vote of thanks for this win as without his two top-class saves, the result could have been very different. That said, I will be very happy if this is a lucky team”. Asked if the starting line-up was his preferred one, he candidly said, “I don’t honestly think I’ve thought about my preferred starting line-up yet. Everyone has to, and will, get their chance to impress. Whoever starts will be in the side on merit”. Meanwhile, Emanuel Bohucký who sat out the game on the bench, has bid farewell to the club after a stay of some fifteen seasons to fly home to complete his signing for Slovakian V Liga side Futbalový klub Mladosť Petrovec. “I would have liked to keep Manny here”, admitted Eike, “but I couldn’t guarantee him first team football, and at 34 he knows he’s perhaps only got a few seasons left. It would have been unfair to keep him here and not play him, and he would’ve been a very expensive luxury to be warming the bench. So there was really only one likely outcome, and I’m glad he’s found a club back home”. “He hit seventy goals in a hundred and seventy-nine competitive appearances from midfield which is a fantastic strike rate and he will be undoubtedly be missed. He is more than capable of being a big player at a good level until he retires, and I wish him the very best of luck”, he added. 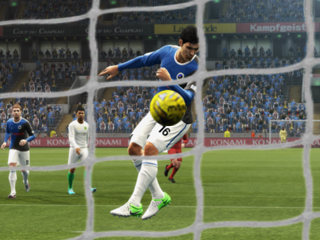 Muhammud Noorani’s powerful header flies into the net to complete our 4-0 win. Brook Street fired themselves out of the relegation zone and right back into contention for a play-off place with an excellent 4-0 win over Smyllum Rovers at New Home Park this afternoon. “It was a priceless win for us as we’ve put a two-point gap between ourselves and Hibernian MFC”, admitted Leoš Loos in the post-match press conference. “These are the kind of games we have to win, and we’ve done exactly that to give ourselves a fighting chance of survival”, he continued. “We dominated possession and were clinical in our finishing”, added the coach. “We played really well and got the win our play merited”. “Muhammud took both his goals very well and the build-up play to Eliseo and Manny’s goals was exceptional. We deserved our victory and I don’t think anyone would dispute that”. Muhammad Noorani opened the scoring after twenty minutes and goals from Eliseo Albeiros and Emanuel Bohucký within the following ten minutes killed any thoughts of a fightback from the visitors before half-time. It took until two minutes from time for Brook Street to add a fourth goal courtesy of Muhammad Noorani, but in all honesty the game was won by half-time. “We showed a determined side to our play that paid dividends, in not only a convincing win but also our first clean sheet of the season”, the coach commented. “We’ve played ourselves out of the automatic relegation zone; it’s up to us to build on that now”, he concluded. 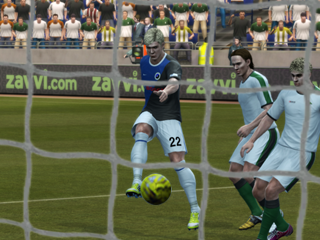 Andrew Cleary blasts home his second goal to secure the 5-1 win and ensure promotion back to Division III. Seldom has an outpouring of jubilation been experienced at New Home Park as that witnessed this evening. Three seasons of frustration and disappointment were brushed aside as Brook Street stormed back into Division III with an emphatic 5-1 win over title rivals The Tiny Spacemen. “We’ve known the heartbreak of missing out on promotion”, said Leoš Loos on the pitch at full-time, “so my first thoughts go out to everyone connected with The Tiny Spacemen”. He continues, “They’ve been formidable opponents and I’m sure they will be there or thereabouts next season”. Then, while saluting the vast Brook Street support he said, “Look at the joy on their faces. This is what it’s all about. They follow us week in week out and we’ve let them down in the past. Today however, we got our act together and they will be watching Division III football next season. The feeling of sheer jubilation makes it all worthwhile”. Andrew Cleary stopped in front of the North Bank during the lap of honour to speak with the club’s most vociferous fans, and at one point was in danger of being carried shoulder-high to a house party before being rescued by stewards. Back on terra firma he laughed then echoing his gaffer’s statement saying, “See! This is what it means to us. The guys and girls on the North Bank are what make the club, and personally I am honoured to be able to play in front of them each week”. Then, he added with a wink, “We are all one big family, and I’ll be going to that party tonight despite the stewards… I’m a Brook Street fan too!”. Back in the relative tranquility of the dressing room, Eike Alanne, who opened the scoring, said, “It’s going to take a while to sink in. I’ve only recently arrived, but for the guys who are the heart and soul of the club, I can imagine the sheer joy that today’s result brings”. He continued, “They’ve really suffered, but now all those seasons of disappointment will now be forgotten. I’m delighted for them, and for the fans, especially the ones we see at club functions. Fans like that are the same the world over; they’d run through walls for their club, and we as players know exactly what it means to them. I’m only glad we’ve managed to win the title”. After having hastily changed from his champagne-soaked kit, Leoš Loos reflected on the game. “We started the game really well and were fortunate enough to take a two-goal lead in the opening quarter of an hour thanks to Eike and Andrew”. He continued, “Although they pulled a goal back, Abel restored our two-goal advantage five minutes before the break and from then on we were never really in any danger”. “Manny’s spot-kick was pivotal, although for me, it was never a penalty, then Andrew wrapped up the scoring with a trademark strike”. “We played some of our best football of the season today”, he concluded, “and we can now enjoy the next few days’ celebrations before we start preparing for next season”. Muhammad Noorani signed off for the season with two goals this morning. Whilst it is always interesting to face teams from overseas in friendly match, the scoreline in this morning’s friendly against Serbian visitors, Idijoti Belosvecki 9/11 was without doubt the least important consideration for the management team. With Saturday’s title showdown with The Tiny Spacemen looming, ensuring the squad will be at maximum possible strength far outweighed the 6-2 scoreline today. “We never meant to play the first team in this match”, admitted Leoš Loos, “that was an error on our part, but fortunately not a costly one as far as injuries goes”. Andrew Cleary and Muhammad Noorani both helped themselves to braces, with Brook Street’s other goals coming from Leoš and an Emanuel Bohucký spot-kick as the home side turned on the style in front of over 3,200 fans. “We were slack at the back again and that’s not good enough”, complained Leoš. “We’ll have to be far sharper on Saturday, as we’ll be facing a far better side”. He continued, “We switched off and it cost us goals again, just as it did on Saturday. A repeat this Saturday could mean another season in this Division which is not good enough for this Club”. Meanwhile, following the game, winger Liam Christie was paraded as the latest graduate of the Academy to be called up to the senior side. “We’ve been keeping tabs on both Liam and midfielder Lachlan MacKinnon who will be joining the senior side next week, and I’ve been impressed with both of them”. He continued, “Liam is lightning fast and Lachlan has a maturity beyond his years. Both have bags of talent and will be excellent additions to the senior squad”. The two youngsters will make their public bow at half-time on Saturday. Muhammad Noorani scores the second of his goals to make the score 4-0. Two goals each from Lope Cabrio and Muhammad Noorani along with strikes from Abel Soffia, Eike Alanne and a Emanuel Bohucký penalty earned Brook Street a 7-0 win over Highlands and Islands United at New Home Park this afternoon. The win keeps the Monifieth side three points clear at the top of the league with only five games remaining, although coach Leoš Loos admitted he’s now keeping a closer eye on title challengers, The Tiny Spacemen. “We’re now at ‘the sharp end of the season’, and depending upon how results pan out next weekend, the championship could conceivably become a two-horse race between ourselves and the Spacemen”. When asked about whether he felt the pressure growing, he replied, “We’re always under pressure to win. Yes, we know that our goal-difference advantage has been whittled away over the past few weeks, but we also know that all we have to do is keep winning and that puts all the pressure on the other sides in the Division”. He continued, “We’re three points clear at the top, so as long as we match the results of our nearest challenger, then there nothing they can do about it and the pressure is all on them. The lead is ours to lose”. Turning back to today’s game he said, “We were competent and professional; nothing more. We knew what we had to do and we set about achieving it. I feel we let them off the hook when they went down to ten men, and we should have won by a greater margin, but at the end of the day, it’s another three points and one game less left to play”. Asked about the injury to Abel Soffia, the coach said, “He’s got stud marks across his knee and we took him off as a precaution, however he should be ok for next week”. He concluded, “We’re going into some very tough fixtures over the last few weeks of the season, so it’s important we have all our full squad available”. 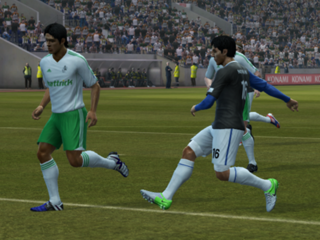 Lope Cabrio blasts home the second of his three goals in this morning’s friendly match. Brook Street’s 7-0 victory in this morning’s friendly match against GoalGetters FC may have been pretty much straightforward, but it came at a cost as Zsolt Baboss picked up a knee injury that puts him out of Saturday’s league match. “It’s just one of those things”, admitted Leoš Loos when he met the press afterwards. “He twisted the knee and we’ll just have to hope there’s no lasting damage”. He continued, “It’s safe to say however that he’ll be sitting out Saturday’s match against Highlands and Islands United”. On the plus side, the New Home Park side bossed the midfield and that proved to be the crucial factor. Not only that, but the midfield were responsible for scoring six of the goals. “We got the break with a very soft penalty that Manny buried, but from then on we were in complete control”, said the coach. “Lope fired in another hat-trick and goals from Abel and Eike had us cruising before Andrew saved the front line’s blushes by netting late on”. He continued, “It was important to get a confidence boosting win ahead of Saturday, but I’ll have to mix things up a little bit for that as Sam Ferretto is suspended and we’re now going to be without Zsolt. We’ll take that in our stride though”. 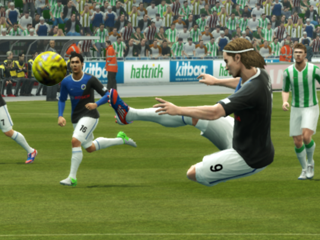 Emanuel Bohucký slams home his fourth goal of the afternoon against Marcascotties. Brook Street edged closer to the finish line with another thumping win this afternoon, this time an 8-0 drubbing of Marcascotties in the Highlands. The players have made a habit of scoring hat-tricks this season, however midfielder Emanuel Bohucký went one better, hitting four of the goals, with Garabed Palasyan, Leoš Loos, Sam Ferretto and Abel Soffia getting the others. While it would be understandable for thoughts to turn to a potential return to Division III after a three season absence, there will certainly be no talk winning the league as far as the coach is concerned. When asked at the post-match press conference, he cautioned,“We’re a long way from winning any titles. There’s still a lot of football to be played before we start talking about championships and the like, and you certainly won’t find anyone in the dressing room talking about it”. He was however more than willing to discuss his side’s performance this afternoon. “We absolutely dominated the game from the first whistle to the last, and I think we were perhaps unfortunate to not win by a greater margin”. He continued, “Manny was outstanding today. He’s got twelve goals to his name already, a terrific strike-rate for a midfielder, and it wouldn’t surprise me if this proves to be his best ever season for the club”. Brook Street’s goals have been coming from all sections of the team, a fact that was evident today and is not lost on the coach. “This season, although the front line are scoring a lot of goals, the rest of the players have been weighing in with their fair share. In fact, in the case of today’s game, only two of our goals came from recognised strikers”. He added, “The other players have lightened the load on the strikers, and I feel this has benefited the team as a whole. We are certainly playing better, and more consistently, all of which is contributing to our improved performance this season. Leoš Loos scores his second goal of the game just after the break. Brook Street wrapped up the first half of the league campaign unbeaten with an emphatic 8-0 win over Marcascotties at New Home Park this afternoon. Coach Leoš Loos hit a hat-trick and Sam Ferretto a brace with our other goals coming from Emanuel Bohucký, Lope Cabrio and Andrew Cleary as the home team ran riot. “We’ve done well in the first half of the season and given ourselves a real shot at the title”, claimed Leoš at the post-match press conference. “We’re three points clear and our goal difference means we’re effectively four points ahead, a terrific platform to build upon”, he added. “We bossed the game from start to finish and indeed, Marcascotties didn’t even have a single shot on goal, such was our dominance”. He continued, “Yes, we were red hot favourites to win today, but it was more important for us to maintain momentum. I think we certainly did that today”. “Now is not the time to rest on our laurels though, and there is still a lot of work to do between now and the end of the season”, he warned. “We’ve got to remain focussed and see the job through”. Leoš opened the scoring in the fourteenth minute and Emanuel Bohucký doubled the lead from the penalty spot six minutes later. Despite being in complete control, Brook Street could only add one more goal before the break, Lope Cabrio putting the ball away after a fine solo run in the thirty-ninth minute. The home fans didn’t however have long to wait for a fourth goal after the break, as Leoš put the game beyond the visitors with his second goal two minutes into the second half. Sam Ferretto powered a header home on the hour mark to make it 5-0 as the pace of the game dropped off, but three late goals from Sam in eighty-six minutes, Leoš from a header two minutes later, before Andrew Cleary wrapped up the win in the final minute. Leoš Loos blasts in his second and Brook Street’s sixth goal in this afternoon’s match. A hat-trick from player/coach Leoš Loos helped Brook Street to their sixth league win of the season and a 7-0 rout of Highlands and Islands United FC in Inverness this afternoon. Eike Alanne opened the scoring just before the half hour mark from a set-piece free kick. 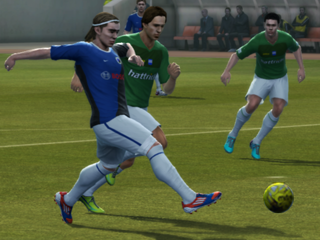 Leoš Loos hit a thunderous volley to open his account for the afternoon ten minutes later. Emanuel Bohucký made it 3-0 from the penalty spot five minutes before the break, and a minute later Abel Soffia made it four with a real pile-driver. Andrew Cleary twisted the knife further five minutes after the break, then two goals within a minute, eight minutes from time completed the scoring and Leoš Loos’s hat-trick. The win maintained Brook Street’s three points clear of The Tiny Spacemen at the top of the league, and as the coach said, “keeps the pressure on our opponents”. Leoš continued, “Our goal difference makes our advantage effectively four points, and the more goals we score, the more that advantage grows”. “With Sparta facing Crass next weekend, something’s got to give there, so it could conceivably become a two-horse race at full-time next Saturday. We have to keep winning to ensure that happens, and that’s exactly what we’ll be doing”, he added. Meanwhile the club are pleased to announce that Argentine side Los Romanes For Ever will visit New Home Park this Wednesday for a friendly match. Kick-off is at 10:30 BST.